I took my front wheel from my fixed gear into Apex Cycles and Service on Friday to get it trued. It was just a little bit off, and it was rubbing against the break shoe and was making a annoying noise every time the wheel went around and was bugging the hell out of me. I am going to pick up the wheel between classes on Monday. In the mean time I just put the front wheel from my Trek onto my fixed gear this seems to work well enough. Although it is not the same as having the big 28c tire on the front that I usually have on there. The Continental Ultra Gator Skin tires are awesome! I really enjoy riding on these tires, in fact since I bought them in early November I have not had a single flat. The slime tubes I put in my tires at the same time might also have something to do with this utter lack of flats. I really think the tires are the main reason I haven't gotten any flats. Continental Ultra Gator Skin tires were on sale the other day so I bought a 25c set for my Trek which I am going to save until it is time to replace the tires on it. Sadly I only have about 500 miles on the Trek, so it might be a while before I replace the tires on it. I really should be putting more miles on my bike then that. Subscribe to Fixed Gears and Beer! Bacteria will Win... If not Inactivated! 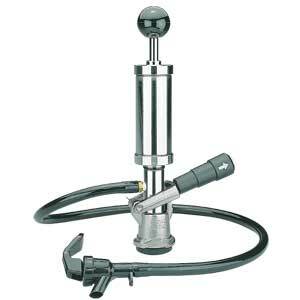 Do you need a keg party pump? Considering putting together a kegerator, home bar or CO2 party dispensing setup?